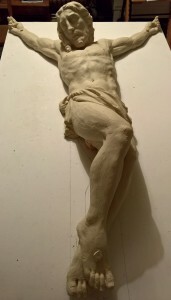 From wooden armature to working clay model (approx. 1.2m length). Next step- to carve the corpus in limewood. The benefit of developing the design in clay is that the problem-solving has now largely been resolved. 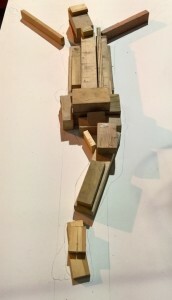 The task is now to establish the deep, modelled cuts that limewood allows in order catch light and shadow- which will make the piece much more dramatic……. and now the corpus is complete- please see the project page for detailed pics!